Kaduna State Governor, Nasiru El-Rufai, has called on the people of kaduna state not to listen to all forms of division and strife, but contribute to building more secured communities for enduring peace in the state. Gov. 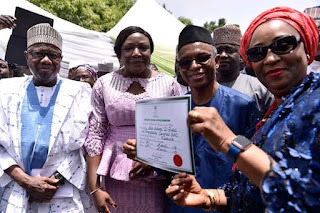 El-Rufai made the appeal after receiving his Certificate of Return from INEC on Thursday in Kaduna state government house. The Governor said it was time for unity of purpose, as such the residents should not wallow in narrow divisions, but collectively work for progress in recognition of the state’s common heritage as children of Adam and Eve. “Our government is committed to uniting the people of this state, as diversity is no excuse for not working together. “We should see and embrace diversity as a source of strength, let us remove barriers and not allow religion or ethnic identities to deter us from respecting the rights of others, acknowledging their citizenship and obeying the law,’’ he stressed.